The dust has settled, so they say. 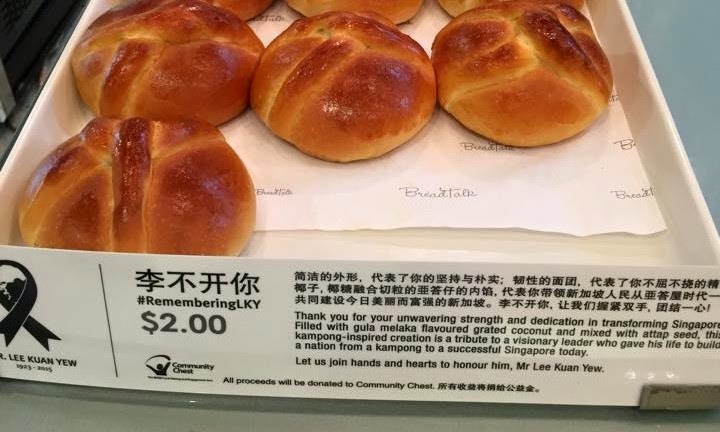 In perhaps one of the biggest events that has happened to Singapore in a long time, Lee Kuan Yew's passing has affected the island nation in ways that almost none of us thought possible. As the nation head towards a post-LKY closure - before everything returns to normal - here are five things that I think went right after Lee Kuan Yew's death, and five things that did not. 1. That display of efficiency. The speed at which the island-wide memorial sites went up. How quickly the state media, television and print, switched gears to do a whole week worth of tribute to Mr Lee. The talk shows and thick reports. It almost feels that everything was staged, that everything was already well prepared, and at the press of a button, everything went into action and sprang up automatically. Efficiently. It was like one moment you're hearing the news of LKY dying and the next thing you have community tribute sitespopping up and CNA already broadcasting his life story on repeat. The precision and speed at which everything was executed was near perfection, so much like the Singapore LKY imagined..
2. That exchange of thoughts. A lot of people criticized Mr Lee as an authoritative figure who clamped down on freedom of expression. But that was far from what happened during the week of mourning. The internet exploded with comment pieces on him, and none of them were really censored (minus Amos Yee, that is, which I will elaborate below). I've seen posts criticizing the over-glorifying of LKY appear on my news feed several times, and the responses were numerous and varied. There were heated arguments in comments section, from a wide range of spectrum. Those who grieved over his death and those who questioned that grief. In a way, despite all our complaints that we lacked freedom of speech, I saw that freedom right there over the week of mourning. Comments coming from both sides of the fence, no holds barred. 4. That sense of pride. Singaporeans are often told that Singapore is like the jewel of Southeast Asia, but without concrete proof, it was something that many found it hard to believe. It was with LKY's passing that we saw his enormous amount of influence around the world, and that despite Singapore's size, we are respected worldwide, because of the efforts of one man. World leaders around the globe as well as countries, mourned with the nation. 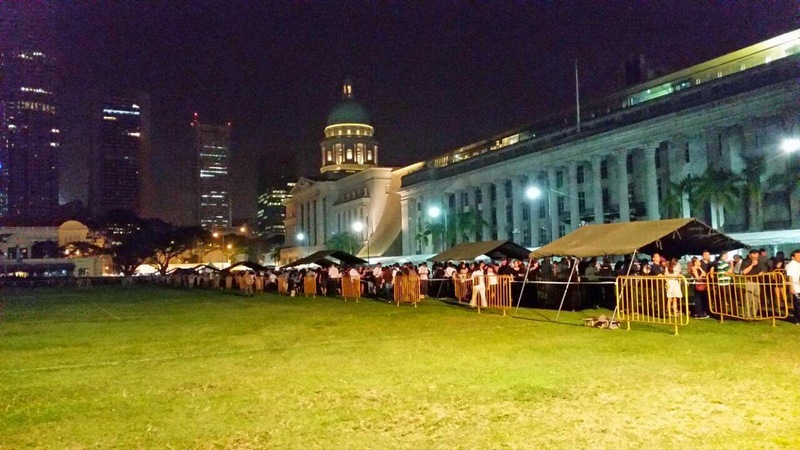 And there was no prouder moment when Singaporeans knew the country stood amongst giants. 5. The nation found its soul. Live long enough in Singapore and you will hear the common talk that the nation has no soul, no identity, no culture. But little do Singaporeans realize that there was a common string that binds everyone together. 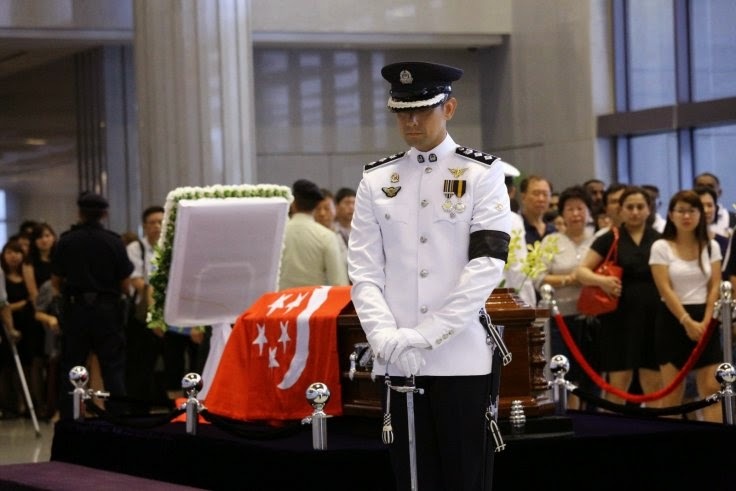 Only when everyone saw the amount of people that turned up to pay their last respects to LKY did all the doubts of lacking an identity melted. 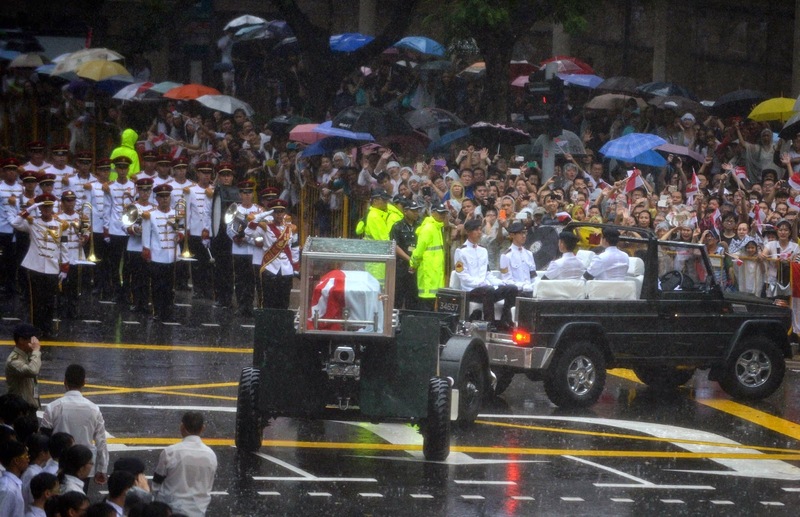 Despite being known as champion grumblers, Singaporeans queued for 8 hours willingly and endured the rain to send LKY off during the funeral procession. No matter what critics will say, it was during this period that the nation came together in a period of mourning, in solidarity, to honour the man that made the nation to what it is today. No matter what language, race or religion, everyone took part in it, one way or another. 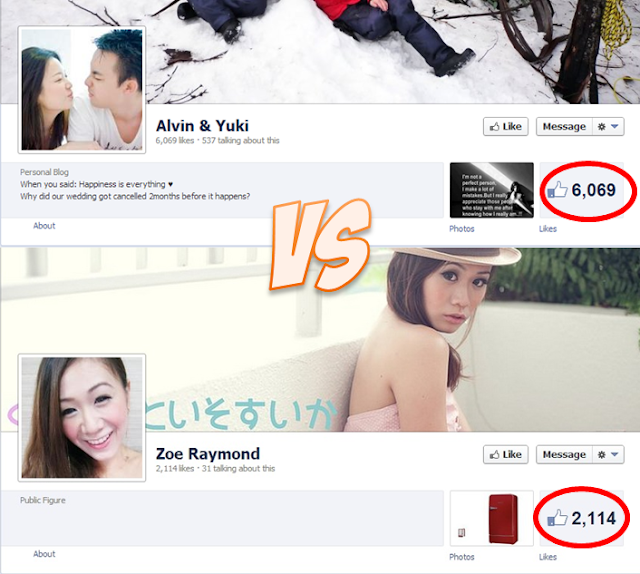 Who said Singaporeans were apathetic? That show of solidarity, that required no government campaigns or cheesy taglines, happened so naturally that the citizens of any other country would be jealous of. 1. That amount of troll and hateful comments. Despite how much we ask for free speech from the government, sometimes I find that it is us ourselves who couldn't handle free speech if it was given to us. When Amos Yee posted his video up, or when ST reported Alfian Sa'at's post, the amount of hate comments were just scary. Not to forget the comments reveling in LKY's death too. Both sides are equally scary. And how do you expect the government to allow you to speak freely when all you do is to shout expletives or condemn people's father mother when you're making a point? How do you expect to have a constructive discussion when all you're making is personal attacks? No wonder the government still thinks that it needs to moderate the internet to prevent it from getting out of hand. I mean if someone calls my mum names, I would punch him too (referencing Pope Francis). Or threaten to cut off my *ahem* for example. Or death threats. I mean seriously yu're threatening to kill someone just because of a comment on the internet? Dude seriously got anger management issues. I guess unless we learn how to behave on the internet, freedom of speech will never come. 2. Breadtalk. Seriously, trying to profit off someone's death? I know you say you'll donate to charity but who will know? And it still gives off the impression that you're profiting. I mean if you gave it away for free that would be another story altogether but trying to earn money off an event like this is just not cool. 3. Amos Yee. Need I say more about a product of education that has gone horribly wrong? Or the lack of parenting that has been given to him? 4. Straits Times. In reporting Alfian Sa'at's post, a reported was quoted that she would put the article up, even though it may trigger undesirable response, because it was "newsy". No wonder people have this impression that Singaporeans are cunning and soulless. 5. Queue cutting. Yep, even when people are lining up 8 hours in a solemn manner you still have people trying to cut queue. Refer to point 4 please. Of course, these are only personal observations from the entire event. What do you think went well (or wrong) post-LKY?